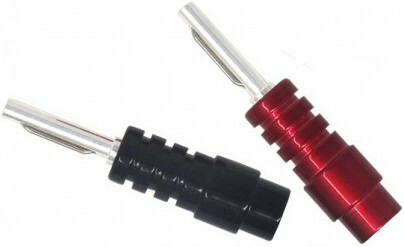 A silver-plated speaker plug that fits any speaker cable as an instant upgrade to your hi-fi system. We also sell these in packs of 8. 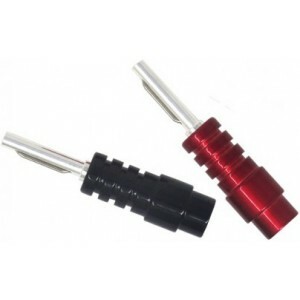 Chord Ohmic, supplied individually, is a silver-plated loudspeaker plug designed to bring both the electrical and sonic benefits of silver to speaker cables everywhere. The new plugs are available separately as a retro-fit upgrade, enabling this revolutionary 4mm connector to improve other brands of cable too. For many years, Chord has been using silver-plated copper conductors paired with silver-plated connectors. Using silver in cables can be wrongly associated with a bright, overbearing sound characteristic. However, this brightness is actually caused by a poor choice of insulation material rather than the silver. Although gold is generally perceived to be the best plating material for high-quality connectors, its only major advantage is its total resistance to corrosion which is not normally a domestic issue. It is usually mistakingly associated with performance and quality due to gold’s high commercial value. Matters are further complicated by the various other plating materials on offer in the hi-fi industry (e.g. rhodium, copper, brass and nickel) with each having wildly differing prices and claimed performance levels. Gold is the third most conductive metal available. It is outperformed by both copper (+140% better) and silver (+148% better). Better conductivity means lower resistance and therefore, less signal loss. Less signal loss means increased performance – as expressed by Ohm’s law! Hence the name of Chord's new speaker plugs. Although pure copper is a good conductor, at room temperature it is susceptible to oxidisation and drastically drops in conductivity when oxidised. Plating the copper can protect it from this process. Plating materials include tin, nickel and rhodium (12%, 33% and 50% as good as gold respectively). Crucially, silver-plating not only makes sense from an electrical point of view, it gives an audibly superior result during listening tests when compared with gold plated connectors. Please note these plugs are solder only.